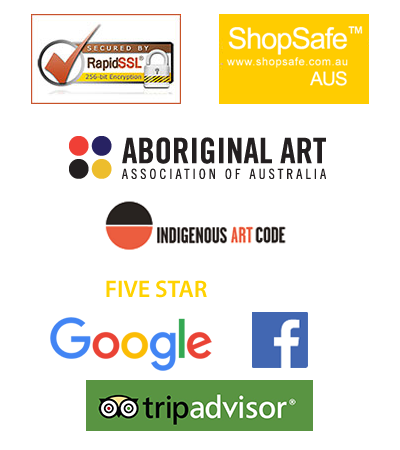 Aboriginal artist Gloria Petyarre was in 1999 announced (Winner) of the highly prestigious Australian ‘Wynne Prize’ for Best Australian Landscape Painting titled “Leaves.” The most esteemed Wynne, Archibald and Sulman Prizes are annual exhibitions eagerly anticipated by artists and audiences alike. In 2004 she was “Highly Commended” for the same coveted award. 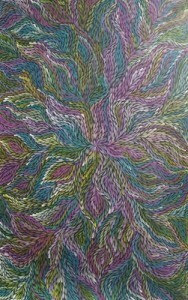 So began the fascination for this beautiful style of Indigenous art work. 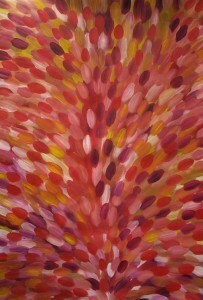 Gloria was the first female Aboriginal artist to win a major award of the Gallery of NSW. Although Gloria Petyarre is said (and is most likely) to have pioneered this bush leaf style, Jeannie Petyarre, her cousin has also laid claim to this technique. Whoever of the cousins was the creator of this style we may never know exactly but what we do recognize is that both artists are exceptional at delivering this style of painting although they do differ to the trained eye. The leaves are painted in a flowing, swirling style which appears to be moving on the canvas, as if blowing in the wind. The swirling brush stroke of each leaf is very fine in a dense pattern of thousands which looks absolutely spectacular in populous abundance. Gloria Petyarre is one of the seven well known Petyarre sister artists from the Utopia Region (Ada, Myrtle, Nancy, Kathleen, Violet and Jean Petyarre). Gloria Petyarre is the most famous of this style but numerous other family members also now paint bush medicine leaf paintings. They vary in style on the original theme but still apply the same brush stroke design. Other Aboriginal artists who produce Medicine Leaf paintings are all related to Jeannie and Gloria Petyarre being sisters, daughters, granddaughters and nieces. They are: Rosemary Petyarre, Dulcie Long Pula, Mary Rumble Petyarre, Margaret Scobie, Louise Numina, Caroline Numina Panaka, Fabrianne Peterson, Selina Numina, Abie Loy Kemarre and Janet Golder Kngwarreye. The medicine bush leaves depicted were originally of the Kurrajong tree of which there are some 30 varieties dating back 50 million years. They scale from small shrubs to massive trees some 30 metres in height. In the larger trees their trunks are used to store water but it is the leaves that have the medicinal purposes. The women of Utopia, the remote region far to the west of Alice Springs where Gloria’s people originated, gather the bush leaves, boil them and then mash them with animal fats (kangaroo,emu or goanna) making a medicinal poultice or paste which can last for many months. The paste is used to heal a multitude of afflictions such as bites, wounds, skin infections, rashes and skin cancer. The bush leaves are also boiled in hot water to make an infusion, or healing tea. Other preparations were used as insect repellent or were thrown into the water to stun the fish. Admirers of the medicine bush leaf paintings often observe their mesmerizing attraction. People are captivated how the paintings appear to be in motion in front of their eyes like the leaves on the canvas are literally blowing in the wind. Many buyers and collectors of medicine bush leaf artworks both in Australia, America and Europe are also medical specialists who buy the works to hang in their consulting rooms to show an Aboriginal artwork with medical connotations. Notably Gloria Petyarre’s signature Medicine leaf paintings have made record sales for $78,000 at Sotheby’s and $34,575 at Lawson Menzies.